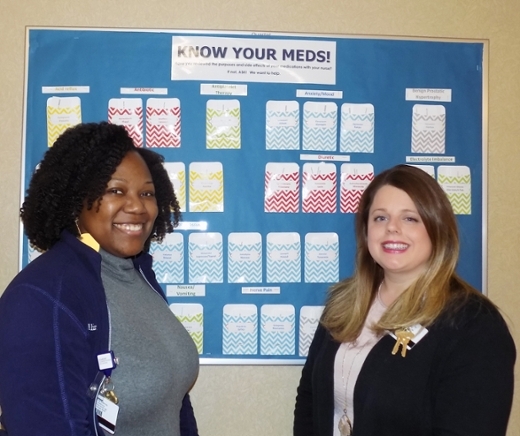 Alishia Davis (left) and Erin McCollum are medication reconciliation assistants at Emory Johns Creek Hospital. They meet with patients when they arrive in the emergency room to prevent medication errors. Emory Healthcare was recently presented with five statewide patient safety awards by the Partnership for Health and Accountability (PHA), an affiliate of the Georgia Hospital Association. These annual awards recognize Georgia health care organizations for achievements in reducing the risk of medical errors and improving patient safety and medical outcomes. Emory Healthcare was awarded a first place Quality and Patient Safety Award for its project to decrease hospital-acquired infections. The project, titled "Healthcare-Acquired Condition Quality Acceleration Team (HAC QAT): Reducing Hospital-Acquired Infections across a Health System, took top prize in the "Hospitals/Health Systems" category. The team's efforts decreased health care acquired infections by 22 percent across Emory Healthcare over the past year, and the team is continuing to develop interventions to further reduce preventable harm. A first place Quality and Patient Safety Award was presented to Emory Johns Creek Hospital for a project to improve medication safety. The project, titled "Medication Reconciliation: New Workflow Strategies to Improve Patient Safety by Reducing Pre-Admission Medication History Errors," won in the category "Hospitals with 100 to 299 Beds." The medication reconciliation assistants work in the emergency department at Emory Johns Creek Hospital and meet with patients as soon as they arrive to sort through their medications to prevent errors. On average, about 300 patients are seen by the team each month. Emory University Hospital Midtown received second place in the "Hospitals with More than 300 Beds" category for its project to improve patient safety culture and teamwork. The project was titled, "Cultivating a Culture of Teamwork and Safety through Implementation of a Hospital Daily Safety Huddle." The huddle meets for 15 to 20 minutes each weekday to look back at any missed opportunities during the past 24 hours, while looking ahead at possible challenges during the next 24 hours. Both Emory University Hospital Midtown and Emory Healthcare were presented with Circle of Excellence Awards. This honor is given to hospitals and health systems that have demonstrated a sustained commitment to quality and patient safety as evidenced by not only winning a 2017 patient safety award, but by earning three or more PHA patient safety awards within the previous five years. "Emory is committed to eliminating preventable harm as part of its focus on providing excellent patient-centered care throughout the Emory Healthcare system," says David J. Murphy, MD, PhD, Emory Healthcare Patient Safety Officer. "These awards recognize the work of our teams across the system as we continually work to improve health care for patients at Emory and beyond." The Partnership for Health and Accountability was established in 2000 to improve patient care and patient safety in hospitals and other health care facilities and create healthy communities.